The people responsible for murdering a former IRA man 20 years ago "should expect police attention" in the coming weeks, a detective has said. 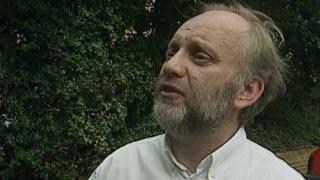 Eamon Collins, who was 45 when he was killed, was an IRA member who gave evidence against his ex-associates. He was beaten and stabbed to death near his home in Newry on 27 January 1999. On the 20th anniversary of his murder, police have said that advances in DNA technology have brought them close to identifying one of his killers. Detectives have made a new appeal for information about the murder. Mr Collins was attacked while he was walking his dogs in the early hours of the morning. His body was found at Doran's Hill, a country road a short distance from his home in the Barcroft estate. Police believe he may have been deliberately hit by a car before he was attacked. "A car full of people pulled up beside him and launched a sudden, sustained and savage assault," said the Police Service of Northern Ireland's Det Insp Conor Sweeney. He was beaten, stabbed repeatedly and "never stood a chance", added the detective. "It's a fact that elements of Eamon Collins' life have been highly publicised in the media and other public records," said Mr Sweeney. "However, that past was behind him and he had publicly rejected violence and turned away from those involved in such violence." The "killers left in their destructive wake a grieving widow and four fatherless children", he added. He said that a full DNA profile was recovered from blood at the murder scene and police believe that was left by a member of the gang. "Forensic analysis of the blood tells us that the person who left it was male and that he himself suffered a severe injury during this frenzied attack. "There will be people in the community, whether in the Newry area or south of the border or anywhere else, who are aware of an acquaintance, a relative, a neighbour suffering such an unexplained wound. "It may stand out in their minds as having occurred on the same day that they heard about Eamon Collins' murder. "This is information that we need people to tell us," he added. Mr Sweeney said that a number of people who were involved in the murder "are going to have to live with that for the rest of their lives". "I would appeal to them to do the right thing and make a difference to Eamon's family by making themselves known," he added. While in the IRA, Mr Collins collected information on police officers and Royal Ulster Constabulary special branch members and set up assassinations over a six-year period. Although he never directly shot anyone, he provided information and recruited members. He was arrested in 1985 and charged with 50 terrorist offences, including five murders and membership of the IRA. At that point he became a supergrass, and more than 40 suspects were arrested as a result of the evidence he gave against them. Most were released after Mr Collins had a change of heart. He walked free from Belfast Crown Court after the judge dismissed his alleged confessions. He later wrote a book, Killing Rage, which was highly critical of the IRA.